MUSLIM FENCER, IBTIHAJ MUHAMMAD HAS A BARBIE DOLL MADE AFTER HER IMAGE. Ibtihaj Muhammad, a Muslim US Olympian has the image of herself reflected back at her in a new Barbie doll made in her image. This matters and it is so deserved as Ibtihaj is the first US Olympian to compete in a hijab, and it was in fencing. 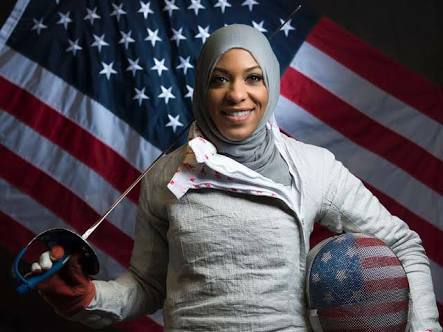 Ibtihaj Muhammad started épée fencing when she was 13, her parents wanted her to participate in a sport that wouldn’t affect her Muslim faith as an hijab sister hence they found fencing. She switched to sabre fencing at age 16. The 30-year-old from New Jersey, represented Team USA in sabre at the Rio Olympics. She clinched a spot on the U.S. team when she won bronze at the Fencing World Cup in Athens, Greece, earlier in 2016. Muhammad says she is comfortable in her own skin, but it’s not always easy being different. However, in a fencing uniform, where an athlete is covered from head to toe, there’s no sign of race or religion.